Unlike most accessories, sunglasses have a practical and stylish function -- protecting eyes from harmful UV rays and adding an air of mystery! Trust me, I have a large sunglasses collection to prove these facts. 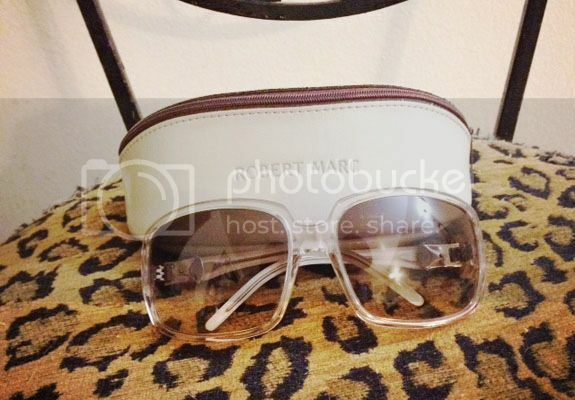 My collection of shades has grown over the summer, so I'm passing along these Robert Marc transparent-frame and milky white-handle sunglasses. These are in good condition with the exception of teensy-tiny smudge on the right lens (see fourth pic), which won't obstruct your vision and looks more like a speck of dirt. Included with the $9 price are the original case and cleansing cloth.